Are you planning the Ultimate Easter Menu? This Easy Green Bean And Bacon Salad is the perfect side dish recipe to enjoy any time of the year. Growing up, Easter dinner was all about cold meats and salads. Growing up partly in the Ukranian tradition of my mom’s family, we often followed the traditions of her Eastern European roots at Easter. Truth be told, Easter was never one of my favorite foodie holidays. Mainly because everything was served cold or at room temperature so it could be blessed at church the day before. Food memories play an important role in all of our lives. One dish that I always looked forward to, no matter what the occasion, is my mom’s Green Bean and Bacon Salad. Living on a 500-acre farm, I jump at every opportunity to make this dish once our own green beans are in season. I absolutely love green beans. They are hands-down my favorite veggie! …And, this recipe also has bacon in it. What more can I say, except everything is better with bacon! 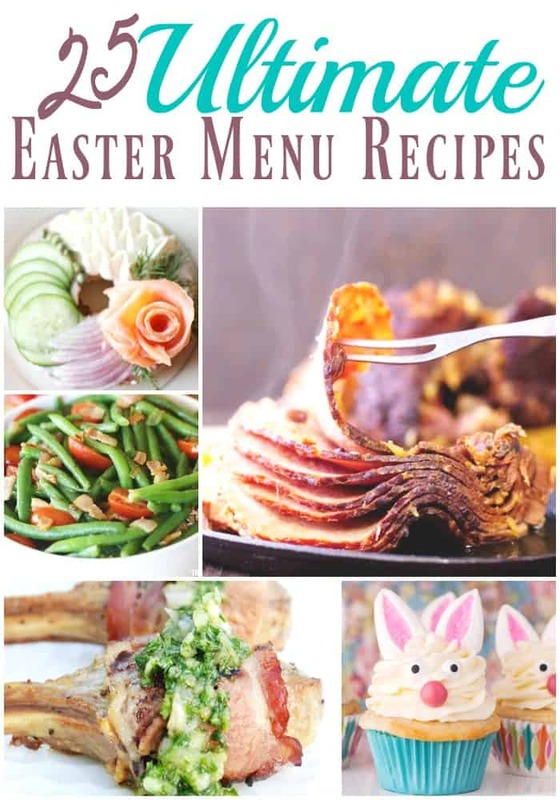 Have you started planning your Easter menu yet? This dish always made an appearance on our Easter table. Mom still makes it to this day. Her recipe is slightly sweeter than mine, however. I have tweaked my version over the years and cut back on the sugar used in the dressing. Another plus to this recipe is that it can be served cold or hot! 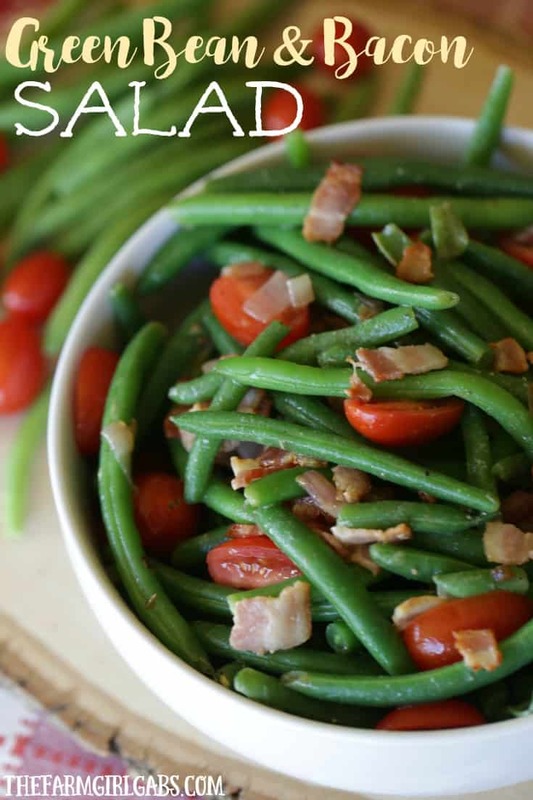 Here is how I prepare this Easy Green Bean And Bacon Salad. After you wash your beans, chop off the ends. I then blanch them in a pot of boiling water for 5 minutes. While the beans are cooking, you can slice the tomatoes and shallots. When the beans are done cooking, remove from the pot and place them in a bowl of ice water to stop the cooking process. This will also keep that beautiful green color too. Now you will want to saute the bacon medium-high heat. Add the shallots to the bacon once it starts to get crispy. When done, drain the bacon grease out of the pan. Add the bacon and cooked green beans back into the pan and give a quick toss so the beans and bacon can get to know one another better. The beans will pick up any remaining bacon grease and bits. 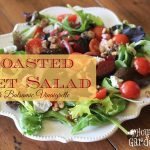 To put the final touch on this salad, I make a simple dressing to bring out the delicious flavors. 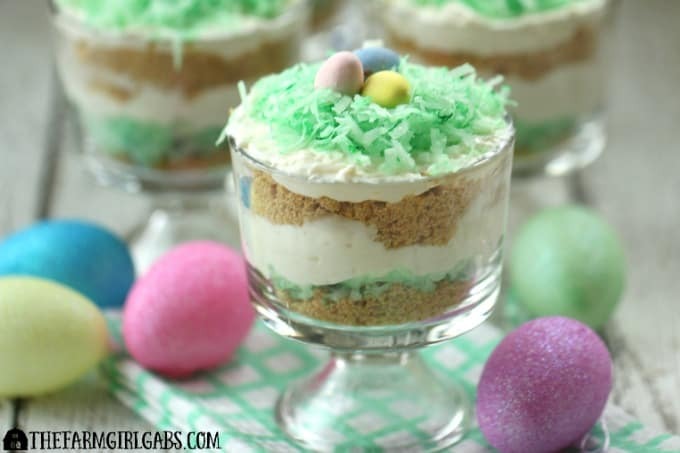 To round out your Easter dinner, these Coconut Cheesecake Parfaits are the perfect sweet ending. I love no bake desserts. These parfaits can even be made ahead of time so you don’t have to worry about preparing them for Easter. 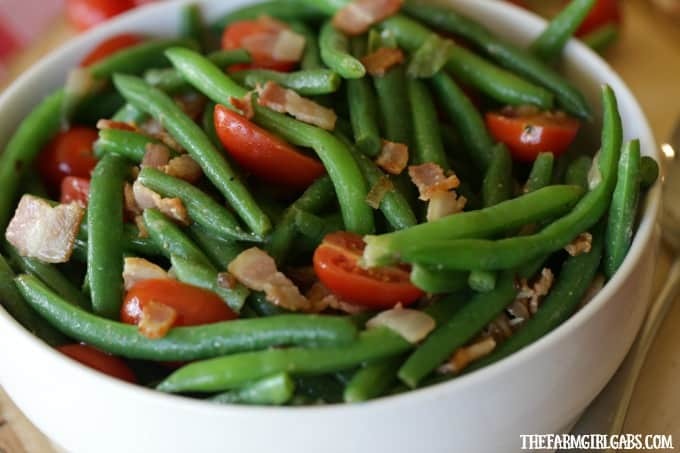 Easy Green Bean And Bacon Salad is the perfect side dish recipe to enjoy any time of the year. Bring a large pot of water to a boil. Add beans and cook for 5 minutes. Make dressing by adding vinegar, mustard and seasonings to a jar. Mix together. Whisk in (or shake) oil. Remove oil from pot and place in a bowl of ice water. Set aside. Add vegetable oil to a cast iron skillet. Saute bacon over medium-high heat in a cast iron skillet. Add shallots once bacon starts to turn crispy. Cook just until shallots are transparent. Drain bacon grease from skillet. Drain beans and add the beans into the skillet. Toss to coat so the bean pick up any leftover bacon fat. Transfer to a large bowl. Add tomatoes. Drizzle dressing over top and toss to coat. Hosting Easter? Attending a get-together and have no idea what to make? We’re here to make your life easier this year. We’ve teamed up with some other amazing bloggers to bring you the ultimate Easter menu. From the main dish to sides, from desserts to even drinks, we’ve got you covered with 25 delicious recipes! Look no further than right here. BAcon makes everything better! Green beans are a must for an Easter side dish! I do not cook with green beans nearly enough! I must give this a try!